So this is perhaps one of the coolest things I’ve come across in the last year! Five-line staff paper!!!!! This is a musical notation heaven! 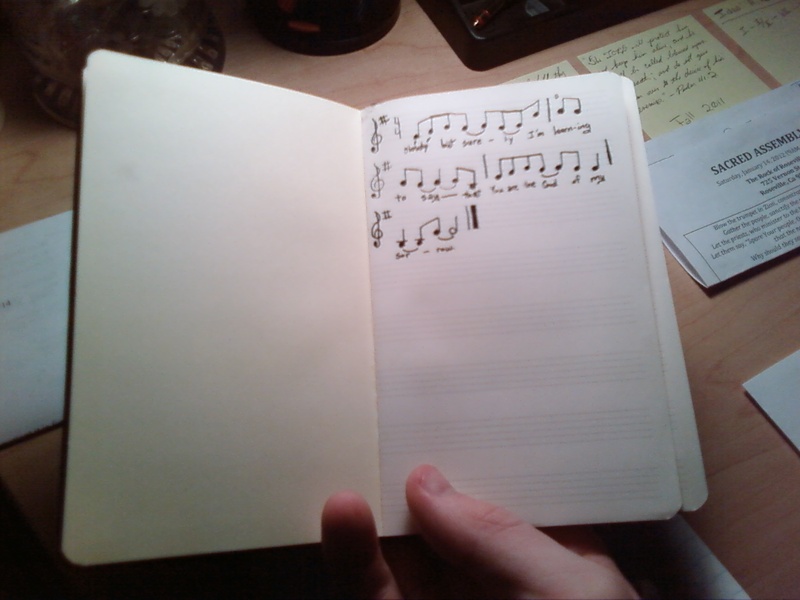 A friend at school had this notebook and offered it to me knowing that I might appreciate it as a music major. I do, in fact, appreciate it. Actually, I adore it. Now, whenever inspiration strikes me with an awesome melody, I can jot it down quickly to notate on my computer later! This is probably the best thing since apple pie. There’s something deeper though that I would like to point out: it has to do with remembering. I love notating music because not only do I not have the money to immediately invest in all of the equipment I need to record at my leisure, but because notation offers a way to memorialize music and gives others the freedom to explore someone else’s musical idea and build upon it. Ah, there it is: memorials. Notation is a type of memorial. It helps us to recall a melody. 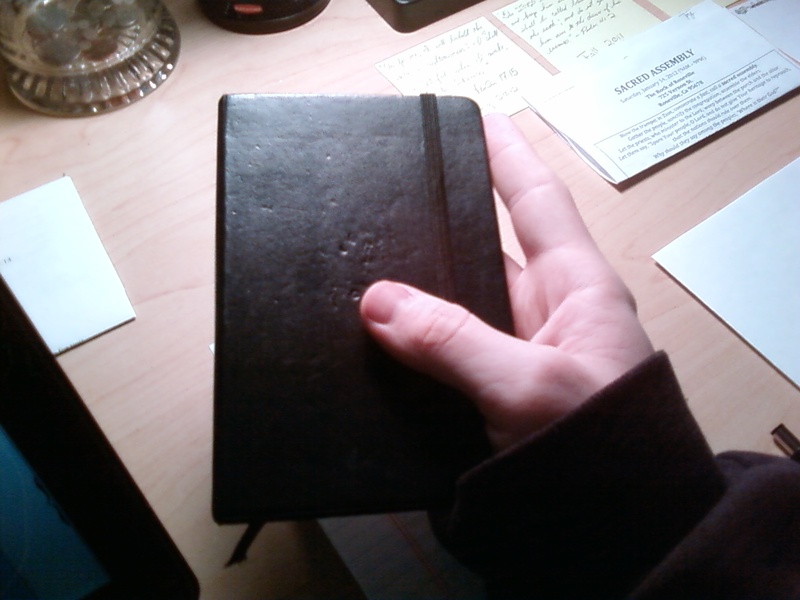 In the same way, writing helps us to recall thought processes and experiences. I think that God likes memorials. When He shows Himself faithful to keep His promises to us, we should make memorials to remember His faithfulness. Memorials of God’s faithfulness help us to not only remember what He’s done, but also to share that experience with others so that they can then have the boldness to seek out their own experiences with God in relation to His promises. With that in mind, let me share with you a recent memorial that I have made. It’s about surrendering to God’s authority over every part of our lives. I recently came to the realization that I was addicted to the feeling of sorrow. I actually subconsciously enjoyed the sensation of feeling bad. It didn’t make sense. In one breath I would be claiming the joy of the Lord as my strength and in the next I would continue to wallow in my past hurt. Of course, as a believer, it is most certainly true that the joy of the Lord is my strength, but if I refuse to give Him my hurt and sorrow, then I prevent the power of God from working in my life. I don’t want to be the one standing in the way of God’s miracles. So, after coming to this realization, I wrote a song about it. A song expressing my soul cry to recognize Jesus Christ as the God of my sorrow (as in “God over” or “in authority, in charge over”). He is not just the God of my joy, He is the God of my sorrow too. He is Lord over the entirety of my life, but since sorrow is an area I’m learning to let go of, it is particularly meaningful for me to recognize Him as God of my sorrow. I have since notated the melody as a memorial—a memorial to remember the song, but more importantly to remember what He has done in my life. This is the power of memorials.